Smoke detectors are critical in every home. Though you can take many smart steps to prevent home fires, you cannot guarantee that this type of disaster will never occur. 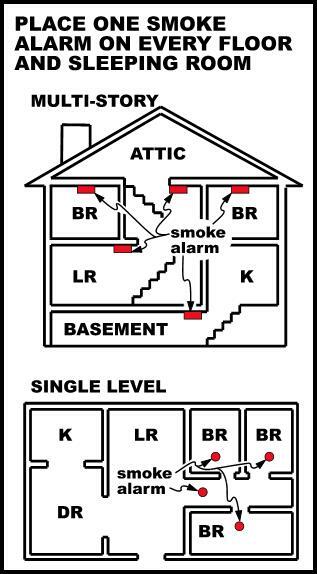 Protect yourself, your family, and your home by properly installing smoke detectors throughout your property. With the right system in place and knowing where to install detectors allows you to rest easier knowing that you’ll hear the alert if a fire starts. There are many different types of smoke detectors. Ionization smoke alarms are more responsive to flaming fires, while photoelectric smoke alarms respond best to smoldering flames. Using a combination of the two throughout the house will give you the most comprehensive coverage. You can also purchase smoke detectors that are specifically designed to accommodate the unique needs in various parts of the house. For example, a smoke detector designed for a bedroom might make a lower chirping sound or use a voice alarm to better wake you from your sleep. 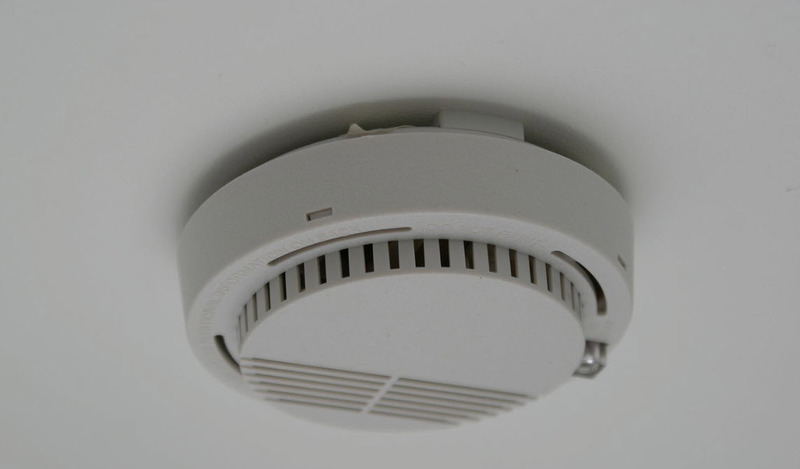 Smoke detectors designed for the kitchen often have carbon monoxide detectors built in as well. At a bare minimum, you should have one smoke detector in every bedroom and at least one smoke detector on every level of the home. This includes the basement and any finished attic areas. Ideally, you will have a smoke detector outside sleeping areas as well and located near the staircase on all floors of the home. Each smoke detector is different, so you should consult the packaging for your system to make sure you’re installing the unit properly. If you’re using a wired smoke detector system where each detector is physically attached to another, you’ll need to be particularly careful about how you connect and install these devices. Most detectors feature a mounting base that you will screw directly to the wall or ceiling. Use a drill bit that’s smaller than the wall anchors to make your holes so you get a snug fit and don’t have to worry about the device falling. Mark your screw placement with the pencil, holding the mounting base to the wall or ceiling in the appropriate location. Tap your screw anchors into place with a hammer and use the provided screws to finish installing the mounting base. The smoke detector should fit neatly over the base. With a small twist, you will usually be able to secure the smoke detector in place. Make sure your smoke detector has fresh batteries and sounds clearly when you press the test button before you complete your installation. You should test your smoke detectors monthly to make sure they’re still in working condition. Ideally, you will change the batteries once a year, no matter how low they are. Fortunately, most smoke detectors will sound an alert to let you know when the battery is getting low, so you’ll have a helpful reminder of what to do before the smoke detector runs out of battery completely. When you test the smoke detectors, have family members go into their bedrooms and let you know if they can effectively hear the alarm. This is particularly important if you don’t have a connected smoke detector system. If people cannot hear the kitchen alarm from their bedrooms, this system won’t provide you with an effective alert should a fire occur. Upgrade to a louder alarm or a connected system immediately. Once you have your smoke detectors in place, make sure your family knows what to do should they go off. You should have a plan in place that specifies where you will all go once you’ve exited the house. Choose a safe, easily identifiable place away from the house where you’ll meet with your family in the event of a fire.